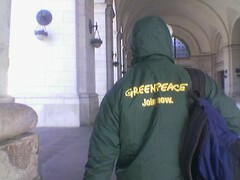 Greenpeace clipboarder, off-duty, at Union Station. When these guys try to solicit me I usually say No and mention the Rainbow Warrior at Tubbataha. “Outdated maps,” my foot, someone fell asleep at the depth sounder.